Hey parents - looking for something to keep the kids busy for Spring Break? I've got a great option for you! Stone Mountain Park is one of Atlanta's best attractions, in my opinion. There is something for everyone to do, all year round, and Spring Break is no exception! Visit through April 10th to enjoy these Spring FUN Break activities! We always like to start our visits at the Great Barn. David could spend the whole day there! Four floors of cannons, ball drops, trampoline floors, interactive games, stairs and nets to climb - so much FUN! The Scenic Railroad train ride is different every season. I enjoyed hearing the history of the mountain during our ride around the base of the mountain on this visit. David, his friend Seth & I took plenty of pictures of the beautiful views as we rode along. The Great American Duck Race, where Mallard Ducks race to the finish line and you could win prizes! You can visit with the ducks and even feed them before the races. Visit the Azalea Stage and see Magic Mark & Einstein the Rabbit! Kids will really enjoy this magic show! Check out the April Fool's Indoor Lasertag! Make sure you wear closed toe shoes for this awesome five minute, 20 player lasertag experience. The Great Locomotive Chase Adventure Golf, or watch the Yogi Bear 4-D Adventure movie, or get splashed at Geyser Towers! (you need closed toe shoes for Geyser Towers too!) You can even trek through the treetops on SkyHike if you are brave enough! You can take the Summit Skyride to the top of the mountain, or hike up if you feel like it. If you get hungry, Stone Mountain Park has plenty of places to enjoy a snack or meal. During this visit, David had pizza, Seth had a BBQ sandwich, and I tried the BBQ chicken nachos. YUMMY! You can upgrade your daily ticket to include a meal, or to add a ticket to ride the Duck. The Lasershow will be offered this Thursday, Friday and Saturday nights, too. This is one of our favorite things at Stone Mountain - the music, the fire, the lasers - WOW! Be on the lookout for the grand opening of The Jump - a thrilling new experience coming to Stone Mountain Park this Spring! 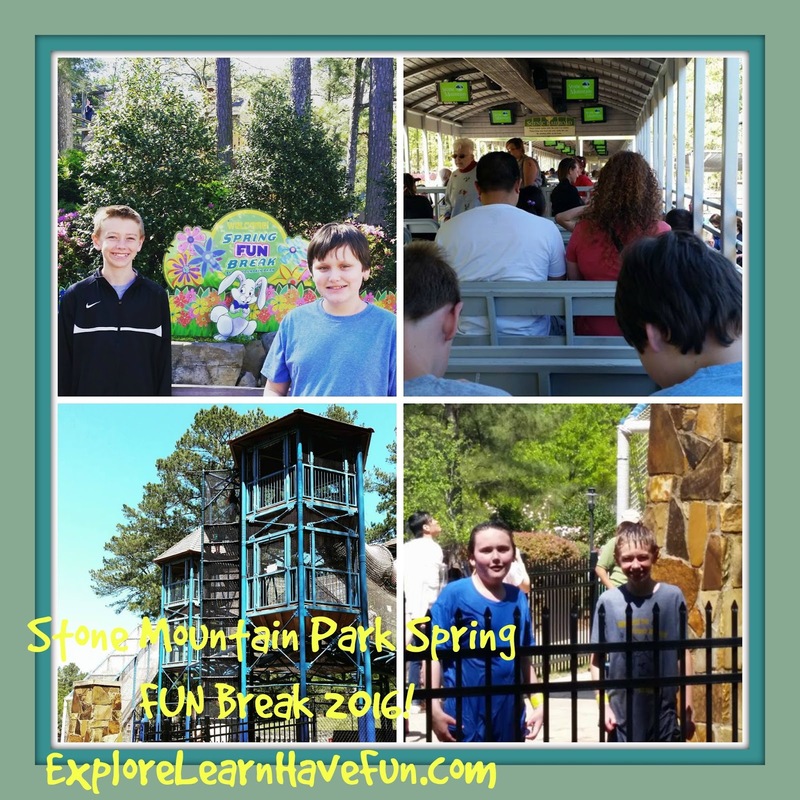 So take a short drive to Stone Mountain Park and check out all of the fun things they have to offer for Spring FUN Break - the kids will have a ball, and you will too! 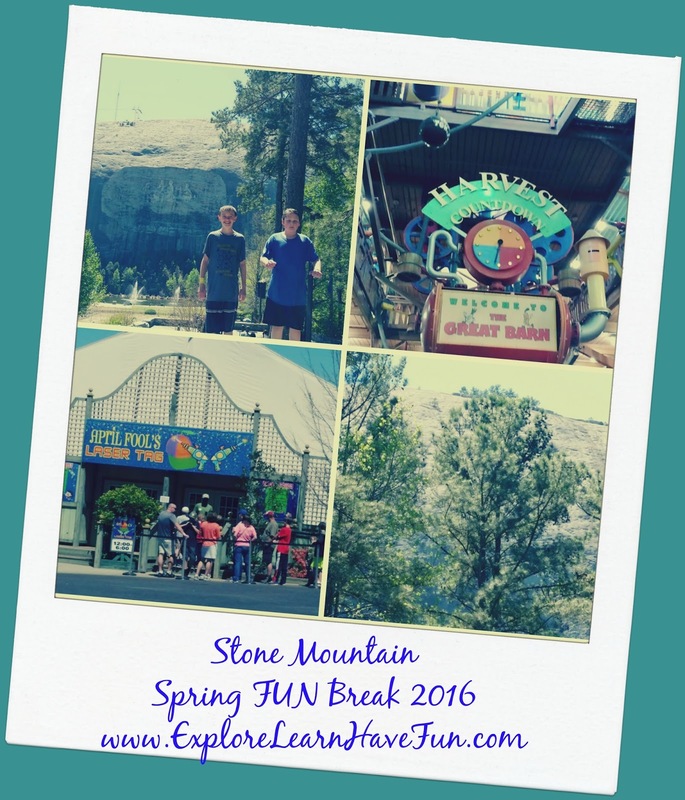 Check the calendar at Stone Mountain's website for all the details on dates/hours/prices. Disclaimer: Stone Mountain Park hosted us for the day to experience the Spring FUN Break activities. All opinions shared here are my own!